Matte lips are a big trend right now! 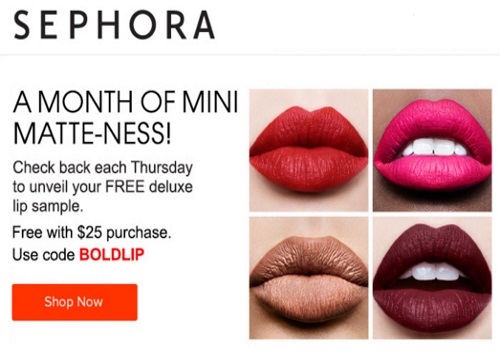 Sephora is celebrating a month of mini matte-ness with a Free Deluxe Lip product sample! There is a new lip product every Thursday during this promotion and are available while quantities last. Enter the promo code BOLDLIP to get a Free Deluxe Lip Product Sample with any $25 online order.